"I don't know anything about him," Kobe Bryant added. "I honestly have no idea what you guys are talking about. I've heard about him, but I have never seen him. I will watch some tape though. I can tell you that." Be impressed. Jeremy Lin just scored 38 points with 7 assists and 4 rebounds -- and drew a charge late in the fourth quarter -- to vault the Knicks to 92-85 win over the Lakers. Actually, be amazed. Runs like this don't happen often in sports. I certainly can't think of the last time an undrafted guard made this kind of impact. 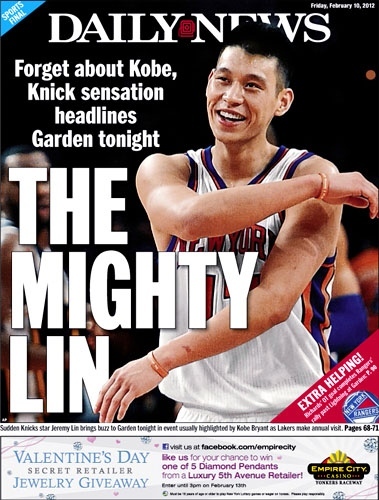 Expect Lin to land on the cover of Sports Illustrated this week (has to be one of the easiest decisions SI editors have ever needed to make). 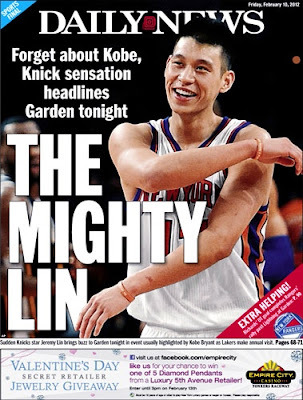 Each of Lin's performances has bettered the previous, and his team is winning, and he's in New York City. What a life. Here's a story from the Daily News to read.